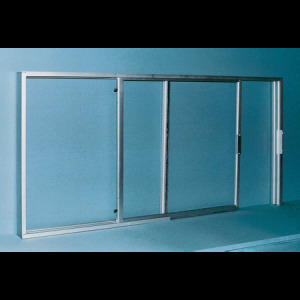 Horizontal sliding serving windows without screens, glazed with insulated glass panels, for installation between mullions. Features: Top hung on nylon glides If active sash is desired at opposite end – specify Left Hand. Horizontal sliding serving windows without screens, glazed with insulated glass panels, for installation between mullions. Note: Series “EI” serving windows are available for screens on special order. For larger sizes, bottom track with bearings is recommended.